Warning: Side effects for reading this can include mild to severe cravings. It’s been awhile since we’ve had unbelievably good food. Food that makes you roll your eyes, lick your lips and rub your belly mMm mmm good. 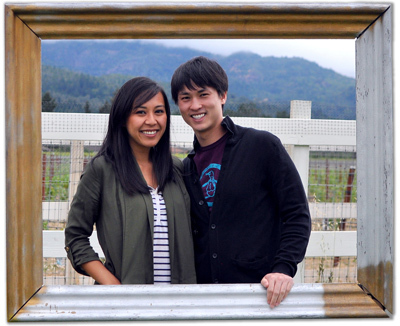 I seriously haven’t felt this way about food since our trip to Cinque Terre in 2009. One of the pleasures of traveling is indulging in local cuisines and Takayama offers many delicious delicacies available from the local land and river. We spent three slow days weaving through the narrow alley and the low wooden buildings in search for good local eats. This region is particularly famous for their miso, it’s in everything and I couldn’t be happier. I’m in miso heaven. 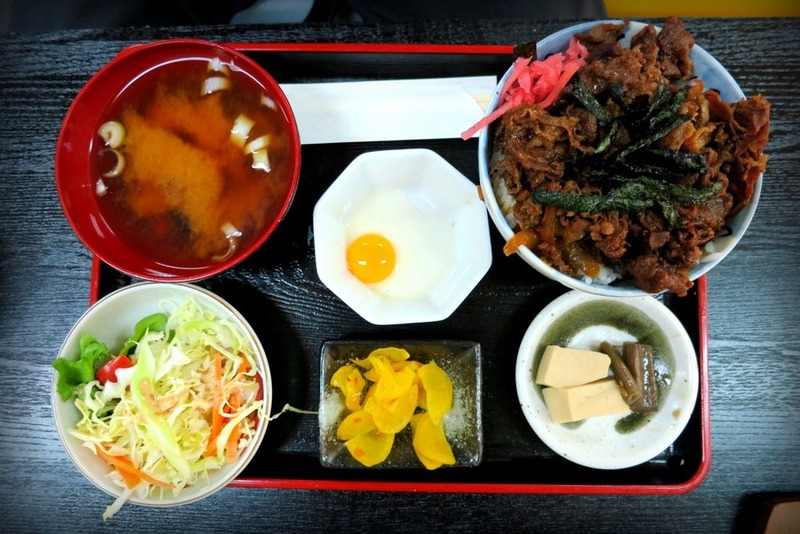 Here are a few of our favorite local dishes from Takayama. Hoba miso is a regional favorite – food seasoned with fermented soybean paste and grilled on magnolia leaves. 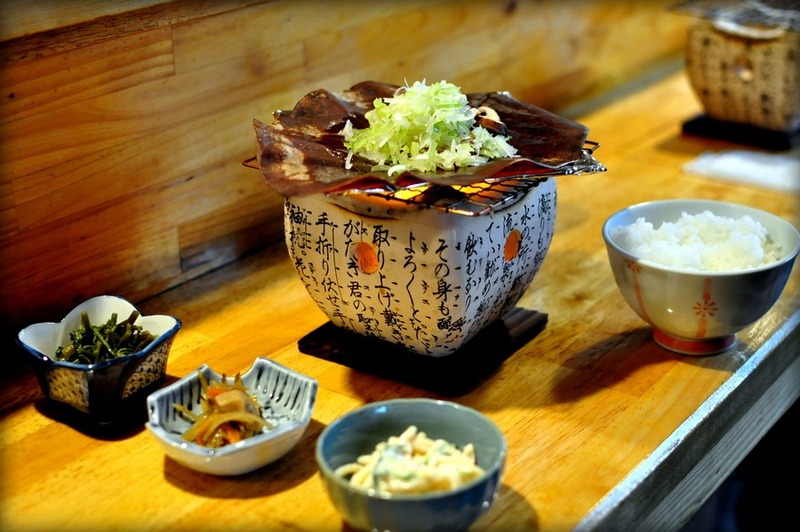 Typically hoba miso is served with sliced Japanese leeks and shiitake mushrooms placed on the magnolia leaf and cooked over a clay stove called a shichirin. It’s best enjoyed with a steaming bowl of white rice! Hida beef is Takayama’s Kobe beef. It’s ideally eaten as steak, sukiya-ki or shabushabu style. We first tried Hida beef for lunch served in a rice bowl. Also to accompany the meal – pickled veggies, sweet tofu, miso soup, salad and a quail egg to go over your rice and beef. We also tried hoba yaki which is hoba miso with thinly sliced raw Hida beef on top. Takayama is famous for its ramen noodles cooked in a miso stock. You can have it veggie style or with various types of meat. Our favorite is with roasted pork. The roasted pork, while a little on the salty side, is even more delicious if you have it on a bowl of steam rice. The smell of grilled miso and soy street snacks in Takayama is so ridiculously amazing it’ll get your senses going. I’m hooked on the mitarashi dango – savory-sweet dumplings made from rice flour, coated in soy sauce, grilled and served on bamboo skewers. Also try rice on a stick slathered with miso, and grilled to perfection. I love that this region’s cuisine is centered around miso. I would’ve bathe in it at the onsen if I could – it’s that good. Other than Cinque Terre, Takayama steals my heart (and stomach) for best regional cuisine.. bar none. What’s the best regional cuisine you’ve ever had? Wonderful food shots! Unfortunately Tony & I only got to spend 1 day in Takayama, so we didn’t get to sample the hoba miso, though we did indulge in two meals with Hida beef and also stopped for mitarashi dango quite often! 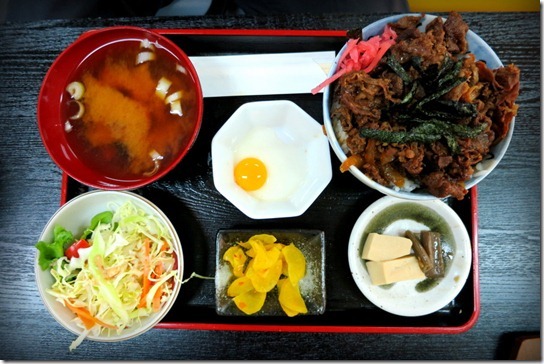 I agree that in a country full of great food, Takayama had some truly EXCELLENT food! Oh, that’s alright. There’s always next time. I was so addicted to those dangos.. lol. sooo jealous that Ramen looks amazing. Same here. I’ll go back for the food alone! I cracked up at “miso hungry” and am befuddled by the concept of rice on a stick. I do love miso, though. I think I’d like Takayama! Haha yay.. I’m glad someone got it. Lol. 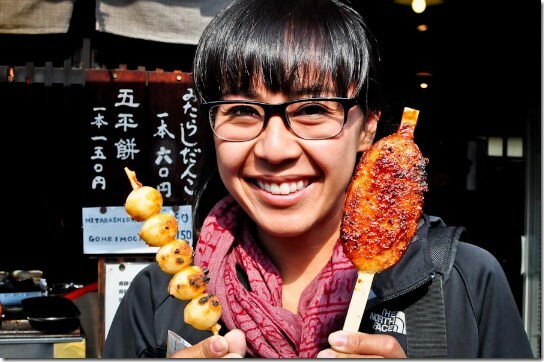 The rice on a stick is like an onigiri grilled with miso dressing. It’s good but the dangos are addicting! mmmm…those noodles look deee-lish, pity you can’t pass them through the screen! Ohh if only you can.. I’d be a healthy ramen size by now. Lol. The noodles were absolute deee-lish! OMG, I am on my lunch break eating salad. What I wouldn’t do for any of those dishes. I love all sorts of food and want to get more adventurous with my Asian choices. This was perfect! 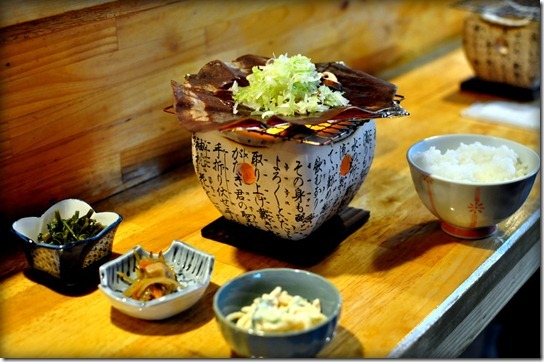 Japan is a great place to be adventurous with food because it’s foodie heaven! I wanna Hida that Beef in my mouth! YUM! Excellent photos and the cuisine all looks amazing. I’m a big fan of ramen done properly. OK, I have to learn Japanese if I am going to remember the names of dishes I have there when I go! Lots of good stuff! There’s too many to name. So many dishes that we’ve never heard of once we got there! Just point, order and eat! Those ramen noodles look much better than what I used to eat in college. 😉 All the food looks delicious – you’ve made me hungry! Gina… even the instant noodles there are way better than they are in the states! I appreciate your attempt to warn us of the side effects of this post, but you just didn’t do it justice. Chris is now angry at me for drooling all over his keyboard. Way to go, guys. Way to go. Oh the title made me laugh! 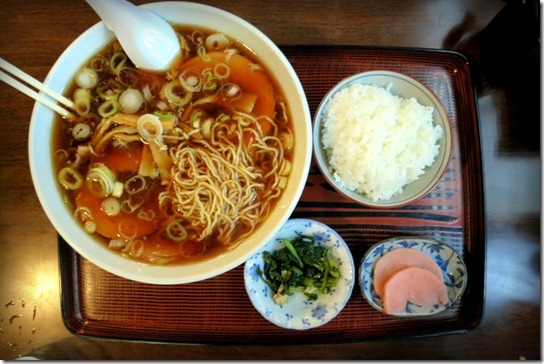 I’ve heard ramen is completely different in Japan than what we consider to be ramen, true? Hmm that miso sounds and looks delicious! What city is this spot located in? it’s all in Takayama which is a small city in the mountain region of northern Japan.